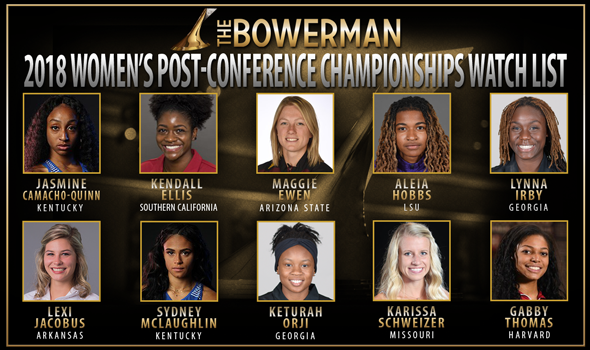 NEW ORLEANS – If dominating conference championships is a major criteria to be considered for The Bowerman, then it would be hard-pressed to find a stronger field of 10 women to be named to the 2018 Women’s Post-Conference Championships Watch List for collegiate track & field’s highest honor. The newest Watch List, announced by the U.S. Track & Field and Cross Country Coaches Association (USTFCCCA) on Wednesday, features 10 women who captured a total of 15 individual conference titles while also playing a part in six relay titles, as well. All 10 women won at least one event title, while seven captured two or more. A multitude of the conference championship marks were historic performances, as well. Jasmine Camacho-Quinn JR Kentucky Hurdles/Sprints North Charleston, S.C.
Kentucky freshman phenom Sydney McLaughlin shattered the collegiate outdoor record in the 400 hurdles, winning an SEC title with a time of 52.75. She bested the previous record of 53.21 set by Stanford’s Kori Carter at the 2013 NCAA Division I Outdoor Track & Field Championships. McLaughlin also helped the Wildcats’ 4×400 team place first at the SEC Championships with an NCAA-leading time of 3:25.99. Keturah Orji of Georgia broke her own collegiate outdoor record in the triple jump at the SEC Championships, posting a mark of 14.62m (47-11¾). A finalist for The Bowerman the past two years, the native of Mount Olive, New Jersey, also captured an SEC title in the long jump with a mark of 6.81m (22-4¼), which is the top jump in college this year. Southern California’s Kendall Ellis quietly put together one of the finer weekends last week, as she won the Pac-12 400 title with a time of 49.99, in addition to scoring in the 200 and helping two relay teams take home titles. Ellis’ 400 time is the second-fastest in collegiate history, and she joins Courtney Okolo, the 2016 recipient of The Bowerman, as the only women to run sub-50 times in the 400 in collegiate outdoor history. The Trojans’ 4×100 (42.85) and 4×400 (3:30.45) also won Pac-12 titles this weekend thanks in part to Ellis. Aleia Hobbs of LSU posted three top-three, all-time collegiate performances at the SEC Championships. The New Orleans native’s 100-meter time of 10.92 not only won her an SEC title, but it also tied her in third-place all-time in the event with Jenna Prandini, the 2015 winner of The Bowerman. Hobbs’ prelim time in the event of 10.93 is now tied for fifth on the all-time chart, as well. The senior also anchored the Tigers collegiate-record setting 4×100 squad that hit a time of 42.05 at the SEC Championships. Arizona State’s Maggie Ewen, the lone thrower on the Watch List, added her name to the collegiate outdoor record book a few more times with her outings at the Pac-12 Championships. She won all three throwing events in which she competed this past weekend, posting a shot put mark of 19.22m (63-0¾) and a hammer throw of 74.38m (244-0) in addition to notching a 59.81m (196-3) in the discus. The St. Francis, Minnesota, native’s mark in the hammer throw is the second-best in collegiate outdoor history while her shot put mark ties her for the third-best throw ever. Lexi Jacobus of Arkansas set a new NCAA Division I Descending Order List-leading mark in the pole vault at the SEC Championships, clearing 4.65m (15-3). The mark by the native of Cabot, Arkansas, is tied for the fifth-best mark in collegiate outdoor history. Harvard’s Gabby Thomas went undefeated at the Ivy League Outdoor Track & Field Championships, as she won three individual event titles in addition to two relay titles. Thomas won the 100 with a time of 11.27, the 200 with a time of 22.76 and the long jump with a wind-aided leap of 6.61m (21-8¼). Her long jump mark ranks her seventh on the NCAA Division I Descending Order List this season. The Crimson’s 4×100 and 4×400 won their events with respective times of 45.16 and 3:36.35. Karissa Schweizer rounded out the returning Watch List honorees. The product from Missouri won the SEC title in the 5000 with a time of 15:58.14, while also finishing second in the 1500 with a time of 4:19.98. There were two names that returned to the Watch List, as well. Lynna Irby of Georgia found herself back on the list after sitting on the first three Watch Lists earlier this season, while Kentucky’s Jasmine Camacho-Quinn returned to the fold after making her debut on the 2017 Preseason Watch List. Camacho-Quinn ran a blistering 12.40 in the 100 hurdles for an SEC championship while also putting herself in second in the collegiate outdoor record book. Her time in the event now sits just behind Clemson’s Brianna Rollins, who won The Bowerman in 2013. Camacho-Quinn was also on Kentucky’s 4×400 title-winning team that ran a 3:25.99. Irby just missed adding her name to the collegiate outdoor record book in the 200, as the freshman ran a 22.25 for an SEC title, just one one-hundredth of a second behind the 10th-best mark in collegiate outdoor history. Dropping off the Watch List, but receiving votes was Northern Arizona’s Brooke Andersen. San Diego State’s Ashley Henderson also received votes. The next Watch List will be announced on June 5 live on TrackTown Live, just ahead of the NCAA Division I Outdoor Track & Field Championships.